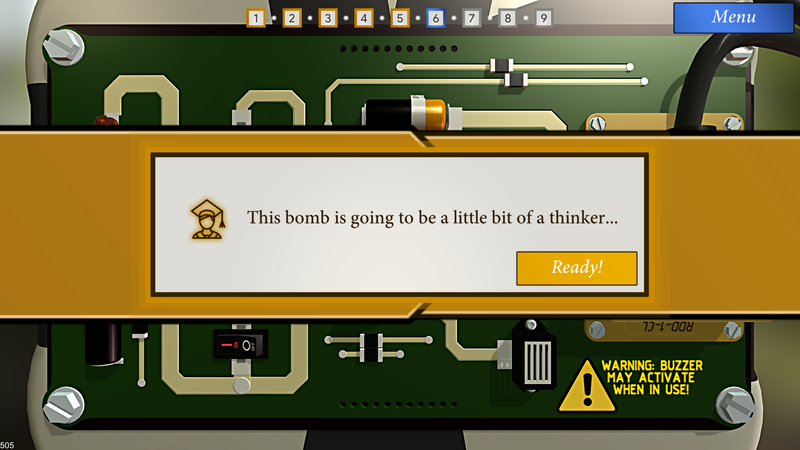 Bomb Squad Academy is now available for purchase on Itch.io, and the latest update features almost twice as many levels as the original release. This game is awesome. I've been playing it more on my free time when i'm not even recording! For sure worth at least 10 mins of your time! Check out my lets play! Found a review on jayisgames.com and decided to do a playthrough myself. What a fun and joyful game! Sounds fun. I like a good puzzler (and may make one to test myself). A short, addictive and fun game. This game is awesome! I hope you are able to make it into a full game. Saw this game and knew immediately that it would be amazingly fun. We weren't disappointed! We'll likely be picking this item up on Steam at some point in time because it was so much fun! You know, it’s one of those games that I came into thinking I’d hate it just like every other puzzle game out there. I instead found something smart, with a lot of effort put into it, even if it gave me a bit of a heart attack failing and all. There’s no way in Hell I’m buying it on Steam, the cancer that is Valve, but I’ll leave you with a recommendation from Kratzen and a three-star review. In my books, that’s as good as a bomb squad simulator can ever get. Great game, made me panic! very cool game! loved the challenge of defusing a bomb! but damn does it get trickier and trickier! well done on creating this masterpiece! This game was AWESOME! Very well put together! Can't wait to see what other games you come up with! I really enjoyed this game, I made a video of it here and I will link it below! Hi! This game is a really cool game! I like the concept and would be AWESOME on mobile! I made a couple video on youtube in INDONESIAN! Check it out! TERIMA KASIH! You should bring this to the Nintendo Switch. I bought Human Resource Machine and had a lot of fun. I see some similarities. There is a bug on puzzle 11 / 14 on the 2nd to last category. 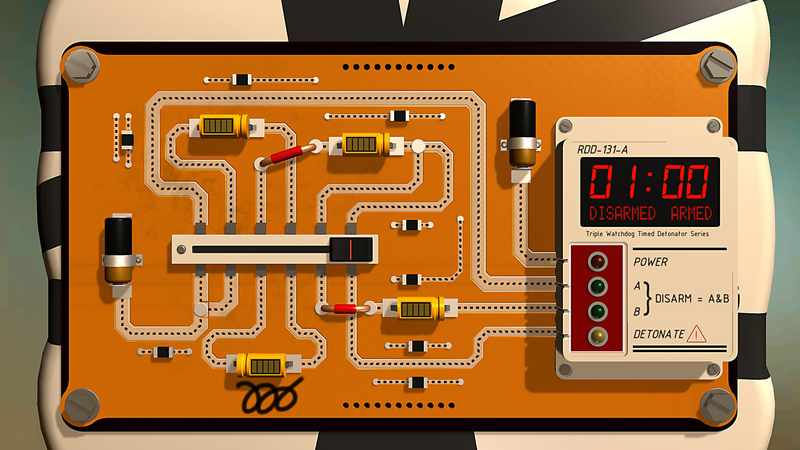 You can cut or not cut the wire and it will still "solve" the puzzle. 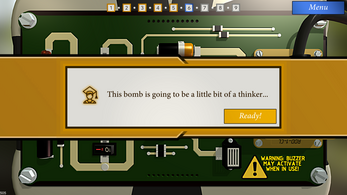 I don't know how realistic it would be, but it would be amazing if you developed a random/procedurally generated mode, for maximum replayabilty, maybe have each bomb have a seed, so you can share ones you find particularly interesting, just an idea, I know it's a lot easier to spitball ideas than to actuall impliment them. Like Leafshade said, I LOVE the game. Its just so short. 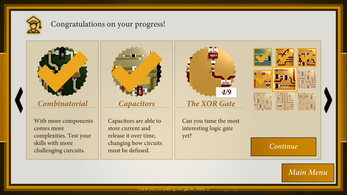 I finished the complete tutorial and last level in about 2-3 hours. If there was a randomly generated mode or like campaign levels that get harder as you go through the ranks, I would play this so much more. Absolutely brilliant demo, fantastic work, cannot wait for more from you, It's such a minor thing, but I love that the wires cut where you cut them, it just feels so good. 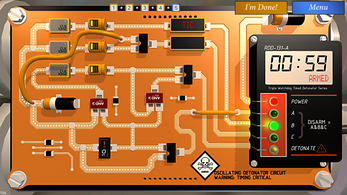 I also love the way you've turned bomb diffusal into a puzzle/logic game. One of my favorite games on Itch.io. Thanks @leafshade, very glad you like the game! Only a couple of weeks before the game is released! I really enjoyed this game. It was a fun little puzzle experience, and I'm looking forward to the full game. I feel like the tutorial really held your hand, and it didn't leave me having to think critically about the puzzles in the tutorial. I really liked when it introduced the button and just said "here's an new thing. don't blow it up." without telling you how it worked (even though it was pretty obvious). 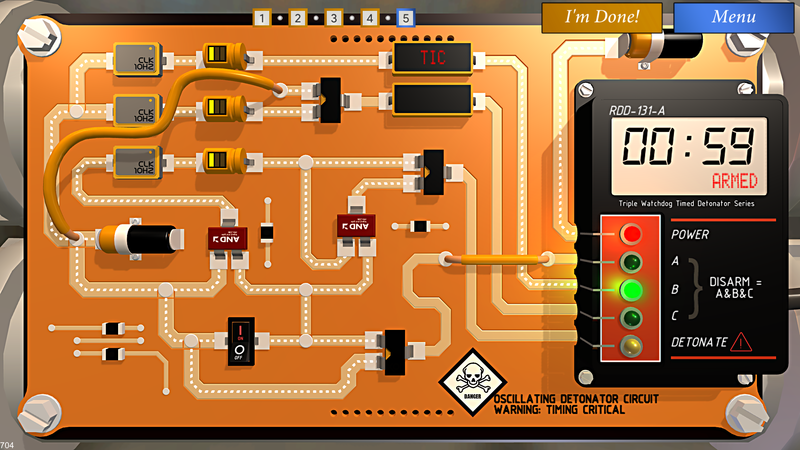 I would love some more complicated components and boards, as some of these, even in the later game, weren't super challenging, and I found myself just speeding through a lot of them. But I am definitely looking forward to where this goes. Excellent puzzle game. 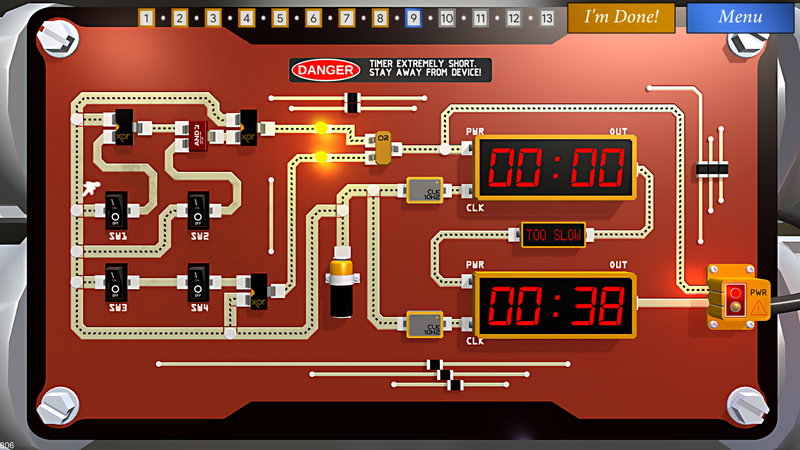 Puzzle mechanics were fun, having countdown timer increased the amount of pressure and suspense. If I had one complaint it would be that the tutorial held your hand a little too much. 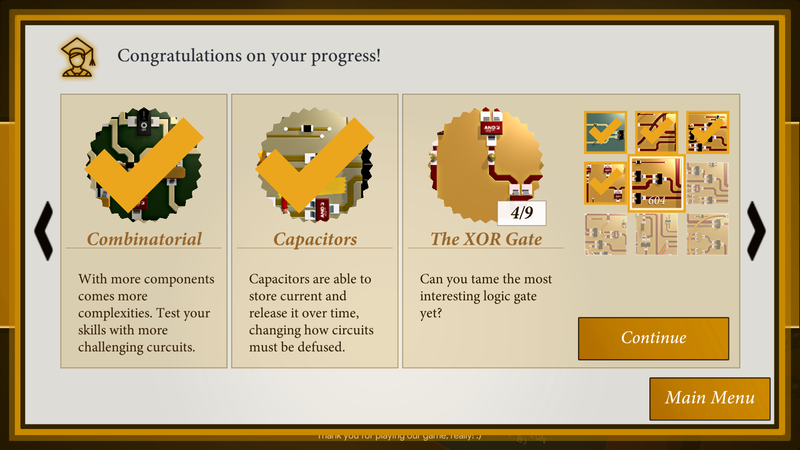 Would be nice to just be able to solve puzzle and instantly finish tutorial. this game is really fun!!! wish that there were more difficult levels to play, though i still loved the adventure that was already there. Really good experience. Maybe a randomizer would be cool. But i guess that will be in the full game. Pretty fun game, but I have some complaints. 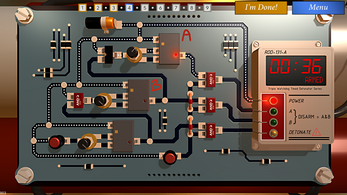 None of the circuits shown in this game are possible because of one simple reason. 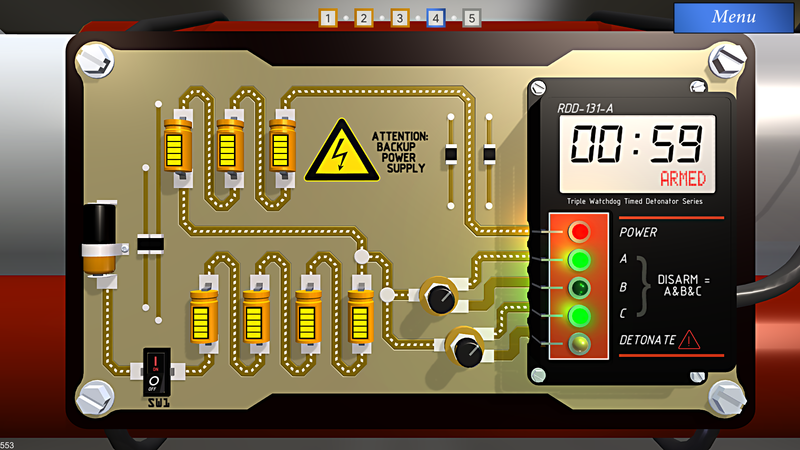 Since it's obvious that the circuits on the circuite boards and bombs are powered by a simple battery, the circuits shouldn't be able to receive any power if they don't have any NEUTRAL WIRES! 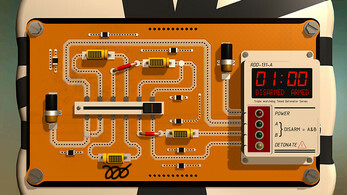 That's how the basics of electronics work, and you failed at that in the first tutorial. 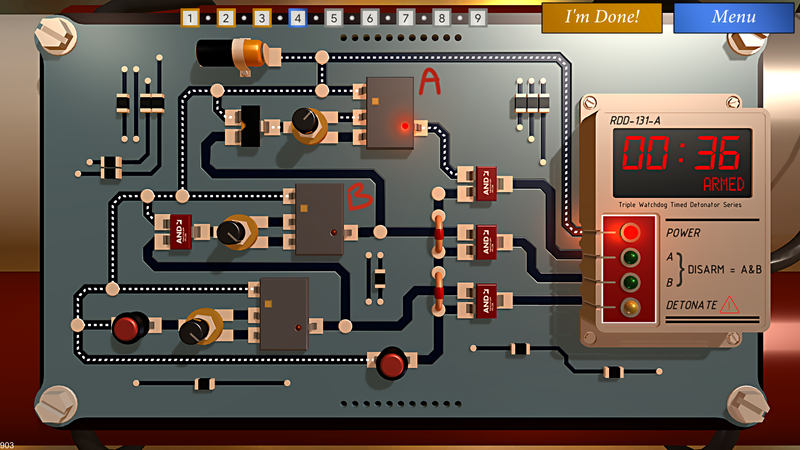 It's a fun game, obviously meant for an audience who isn't fafmilier with the basics of electronics, but the no neutral wire thing kinda bothered me the entire time I played. 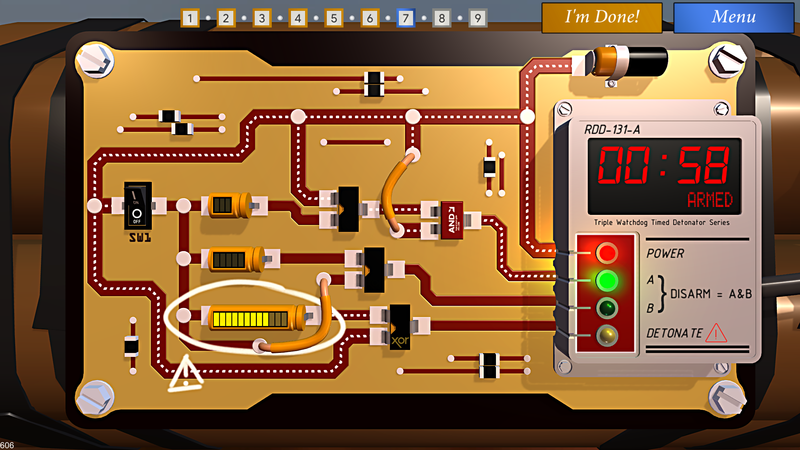 Also, of coarse wires are kinda like traces because they ARE traces, at least the shorter ones used in circuits are. On a higher note, I have a suggestion for your game. 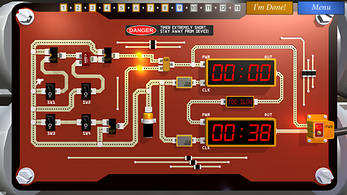 You could add a custom mode where players could use a bread board (a tool used for making temporary circuits) to make their own puzzles. 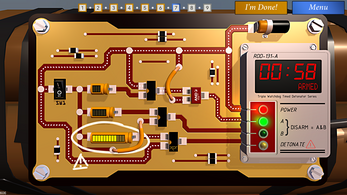 If you include neutral wires, this game could be very educational for learning about electronics and stuff. Or just leave it as a fun little puzzle game with a bunch of puzzles. Thanks for reading my review and suggestions! Thanks for your comment! 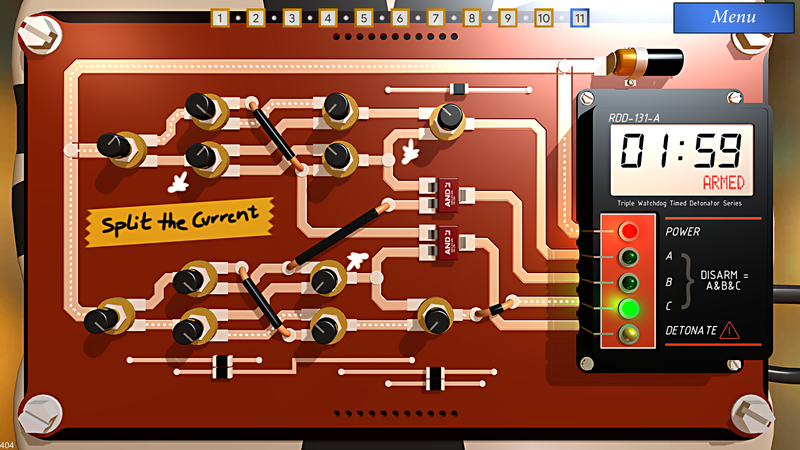 You are correct that the circuits wouldn't actually work because there is no current return path anywhere. 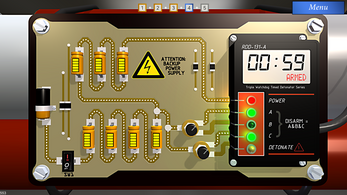 Similarly, logic gates usually need separate power supplies as well. We just decided to make things simpler to keep puzzles manageable. 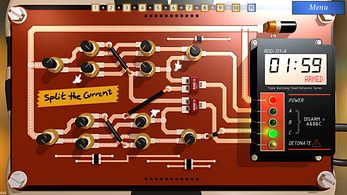 The ability to make your own boards is the single most requested feature, but it's also the most complicated to implement, so I can't say right now if we'll be able to add it. If the full game does well, then it's possible we will! Well, thanks for replying. Your game really is a fun one, and I hope it does well. Have a mira day!